The Registry is Plymouth’s premier new high-end condominium development, using green construction, fresh life-style designs and contemporary high-end finishes. The Developers, Rick and Megan Vayo have assembled a group of professionals including; Architect Jeff Metcalf, Engineer Mark Flaherty, Designer Christina Patton along with their in-house construction management team supervised by Jason Vayo. MEGRYCO, Inc., the owner of 7 Russell LLC, has been serving the real estate needs of the Southern New England community for over two decades. We are a multi-generation family business that prides itself on bettering the communities we reside in and building long-lasting relationships with the tenants and clients we serve. To that end, MEGRYCO, Inc. has roots in many local towns and cities with complexes ranging from single- and multi-family residential structures to over 50,000 square foot multi-tenant commercial facilities. Recent residential projects include the groundbreaking redevelopment of the former Armory in downtown Plymouth, Residences @ the Armory, which is completed and sold out, and 599 Washington Place in Pembroke. Our highly skilled staff and contractors, years of real estate development experience and careful handpicking of choice properties all combine to create a full-service design, construction, management and leasing operation built to fill the current and future needs of our existing and potential clients. Rick Vayo – Rick has over three decades of experience in residential and commercial real estate development and construction. During his extensive career, Rick has developed for the sale, lease and build-to-suit of over 500,000 square feet of commercial and retail space. In addition, his residential development and construction resume includes the construction, renovation and management of several hundred units and single-family dwellings. Rick has focused his real estate energies on the South Shore and has a comprehensive knowledge of these communities. Working with nearly all local cities and towns, Rick has developed keen working relations with area boards, town/cities planners and officials. With a passion for the re-development of historic/dilapidated structures, Rick is highly focused on helping to revitalize communities and takes an active role with local commerce and charitable groups to insure the total success of not simply a single project, but the overall community. Megan Vayo – Megan brings a fresh and insightful perspective to the new construction, rehabilitation and property management divisions. Having grown up in the family business, Megan obtained a business management/entrepreneurial studies degree along with several years of experience working on career placement with architects, engineers, designers and property managers throughout New England. This experience coupled with a sharp sense of design and dedication to providing well-engineered, eco-friendly housing adds a new dimension the team. Megan acts in a hands-on capacity overseeing design and quality aspects of construction and serves as the liaison to the sales team making herself available to all buyers to explain and detail the project’s overall vision, answer questions and help finalize selections. Jason Vayo, Project Manager, is the on-site project leader hand chosen to see Registry Square to its successful completion. He brings two decades of experience in the construction industry including management and hands-on skills in framing, finish and mechanical systems. Jason manages the day-to-day details of the construction project including subcontractor bidding and coordination, job safety awareness, budget management, schedule management, daily project reporting, and communications. Jason is an experienced and effective liaison between the Architect, the Developers, the Design Team, and the Project Superintendent – keeping the team on vision. Ryan Vayo Project Coordinator/Sales Liaison is the vital link between on-site construction and our sales team. With experience in construction, construction management, business management as well as marketing, Ryan is able to bridge the gap between the needs and desires of our clientele and the day-to-day construction process. Ryan works closely with the project manager to aid in the coordination of all subcontractors, schedules and budgets as well as meeting daily with the sales team to insure a seamless process that ultimately delivers not only a home, but a memorable and enjoyable experience. Architect, Jeffrey Metcalfe, is a licensed Massachusetts architect with nearly three decades of experience across a broad spectrum of projects. With degrees in architecture and architectural engineering, Jeff prides himself on not only his new and distinctive designs, but also the integration of history, community and lifestyles into his works. With experience and active projects from Boston to Province Town, Jeff captures the essence of New England while having a unique flare for style and functionality. As principal of Jeffrey Metcalfe Architects for over a decade, Jeff, and his team of architects, project managers and designers; have consistently won awards for residential, commercial, and mixed-use projects. The Metcalfe team has been working on the Registry Square project since its inception. Their vision, tools, experience, and knowledge bring an inspired and creative perspective to the new design of an historic landmark. Engineer, Mark Flaherty, received his engineering degrees from Clarkson University and Duke University and has been a licensed engineer since 1979. Mr. Flaherty has over 40 years of engineering experience in civil and environmental engineering projects throughout Southeastern Massachusetts. He has worked as a peer review consultant for many towns in Massachusetts. 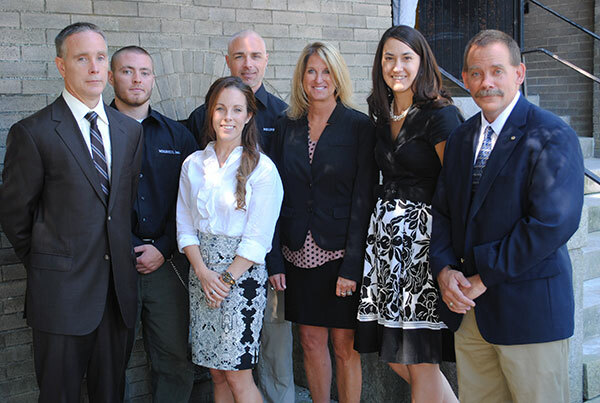 Flaherty & Stefani, Inc. since its inception in 1988 has been an active member of the Plymouth community and has been involved in numerous charitable endeavors. Christina Patton, ASID, LEED AP is the owner and principal designer of CP Interiors. Her career spans two decades including both residential and commercial projects. Christina possesses a passion for design that permeates all aspects of every space, home and complex she creates. Currently, her scope of work includes multi-unit renovation projects, private residence and hospitality. Christina holds a great appreciation for renovations and loves to create interiors that maintain the character of an existing space. An important aspect to renovations is the inclusion of sustainable design, otherwise known as “green” design. At CP Interiors, sustainable design is a priority. Christina’s education includes a Bachelor of Science in Interior Design from Virginia Polytechnic Institute and State University as well as NCIDQ and LEED AP certificates. She is also a professional member of the American Society of Interior Designers (ASID).